DinoFilter Central Coolant management system consists of one or several filtration units (cassettes) which are assembled in the central unit. The contaminated fluid from the machining process enters the central unit into the dirty tank (filter tank). The contaminated fluid is sucked trough each filter cassette. The purified fluid is pumped to the built-in clean tank. The filtrated sludge is collected in the out side of the filter mesh. The filter mesh is manufactured in acid prof stainless steel for extended life time. The number of filters is model dependent. Each filter is independently performing the filtration function. If needed for any reason a filter cassette can be physically removed from the tank any time during on going production. No filter aids such as paper is needed for the filtration. So no need to worry about getting rid off any other waste than the ones from your processes. It has simple construction with a limited number of moving parts, required maintenance is limited. Dinofilter has a modular structure, you can remove one cassette in order top perform maintenance, while the unit can still perform its filtration function. The DinoFilter has an outstanding efficiency in clarifying fluids containing fiber type solid materials such as grinding swarf from steel grinding or chips from cutting machining e.g. aluminium machining. Filtration quality: Standard: 25µm. 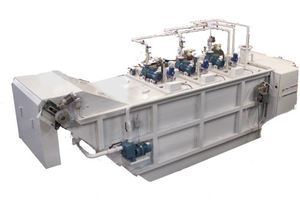 (Customized can be lower but may affect the flow rate capacity).